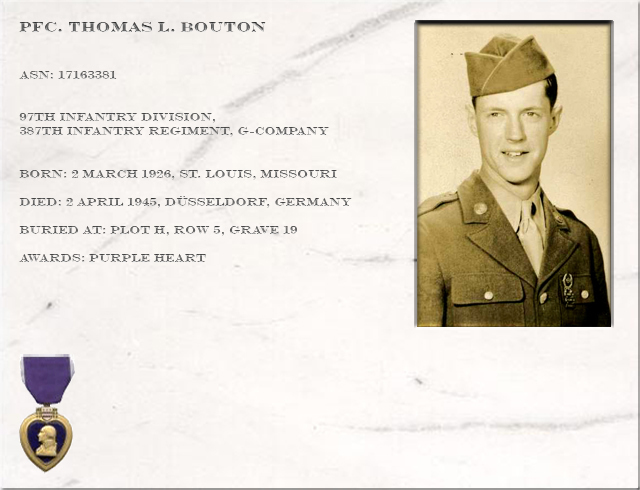 Thomas Leonard "Tom" Bouton was born on March 2, 1926 in St. Louis, Missouri. He was the only child of Leonard B. and Paula (Jaenicke) Bouton, and the grandson of Paul Albert Jaenicke, who immigrated to America from Berlin, Germany in the 1880's. Tom had two cousins to whom he was very close. Their names are Paul and Donald Jaenicke. Tom served as Student Body President of Hanley Junior High School in University City, Missouri. He graduated from University City High School in 1943. His main hobby was playing drums in the school band. He was also known for his baseball ability as a southpaw pitcher during his high school and brief college careers. While attending University of Kansas in Lawrence, Kansas, Tom enlisted in the United States Army in March, 1944 at the age of 18. 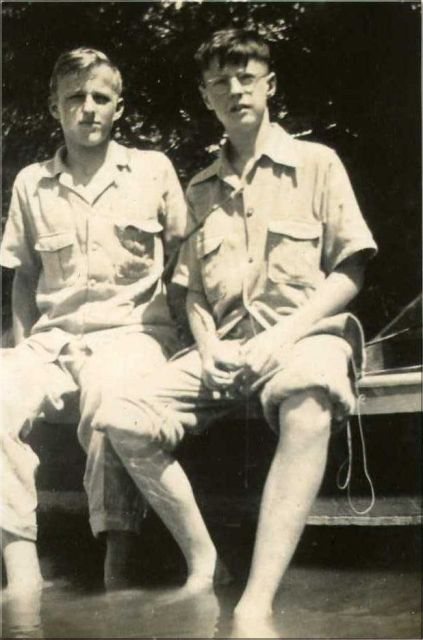 Thomas Bouton (R) fishing in Missouri with his cousin Paul (L). He was sent to Camp Cooke, California for training. His baseball throwing skill came in handy during army training for grenade throwing. While at Camp Cooke he received a marksmanship medal. From Camp Cooke he was sent to Camp Kilmer, New Jersey. He departed New York City by troop ship "Monticello" on February 18, 1945, and arrived LeHarve, France on March 2, 1945 (his 19th birthday). Tom served with the 97th Infantry Division, 387th Infantry, Company G. He entered Germany on March 27, 1945. 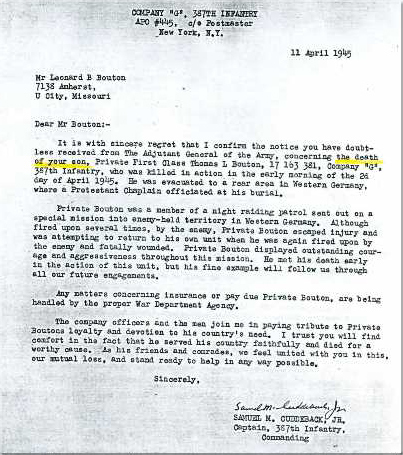 His unit entered combat on March 29, 1945. The 97th Infantry Division "the Trident Division" was activated in 1918 to serve in WW1. Eventually only 1 regiment (303rd) served in WW1, the division was de-activated at the end of 1918. On February 25, 1943 the division was re-activated. After basic-training in Camp Swift, the division participated in the Louisiana maneuvres in the fall and winter of 1943. Additional training was received in Fort Leonard Wood, MO. War Department officials decided that the 97th would receive amphibious training and then be sent is the Pacific for operations against the Japanese. In July 1944 the Division relocated to Camp San Luis Obispo, California, near Morro Bay and Pismo Beach. Under the supervision of the Navy and Marine Corps, the Division began training for amphibious operations. In September 1944 the 97th was transferred to Camp Cooke, California, situated directly on the Pacific Ocean, the men of the 97th began preparations for overseas movement. The War Department later changed the embarkation date to early January 1945. In the middle of December, these plans were abruptly altered. On December 16, 1944 in an attempt to cut the Allied Forces in two, the German Army launched a massive offensive through Belgium's Ardenne Forest. This offensive became known as the Battle of the Bulge because of the large bulge in the front lines. By the middle of January, American units had retaken most of the ground they had lost, but suffered approximately 75,000 casualties. Because of the high number of American casualties during the Battle of the Bulge, several American units earmarked for the Pacific, including the 97th Infantry Division, were ordered to the European Theater of Operations for the final assault on Nazi Germany.The Division traveled to the east coast by train, arriving on February 13, 1945 at Camp Kilmer, New Jersey. On February 19 about 14,000 men of the 97th Infantry Division departed from New York in a large convoy of ships.On March 1 the Division arrived at La Havre, France and proceeded to a nearby staging area called Camp Lucky Strike. Map of the first phase of the 97th Infantry Division attack. The 97th left Camp Lucky Strike on March 27. On the following day the Division crossed the German border a few miles west of Aachen. A short time later it passed through the streets of that battered city. In early April the Trident Division became involved in a major offensive operation in the Ruhr area. The Battle of the Rhur Pocket was one of the last major battles of World War II. With the defeat of the Army Group B at the end of April, Germany lost control of the war, and from that time on was only able to offer token opposition to the advancing Allied forces. 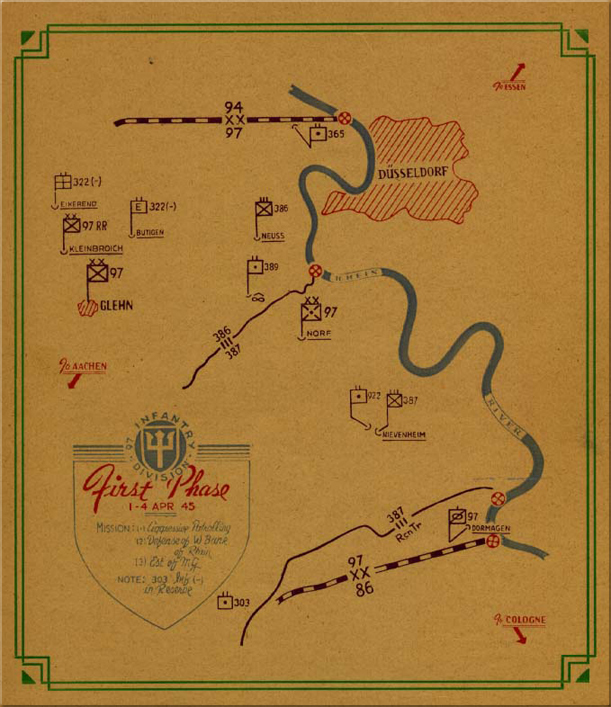 After operations in the Rhur pocket were completed, the 97th Infantry Division was quickly transferred to the Third Army sector along the Czechoslovakian border. As the 97th prepared for the invasion of Czechoslovakia, Flossenburg concentration camp was discovered in the Division's sector of the Bavarian forest. On April 25 regiments of the 97th Infantry Division, supported by armored units, invaded Czechoslovakia. On May 7 all American units were directed to halt offensive operations pending announcement that the war in Europe was officially ended. On Victory in Europe (V-E) Day, May 8, contact was made with a Russian patrol several miles north of Pilsen near the town of Zlutice. Another incident took place on V-E Day. As the men of the Trident Division waited for the official announcement that the war in Europe was over, a lone German fighter plane swooped down and strafed the command post of the 3rd Battalion, 303rd Infantry Regiment. The defense fire against this plane was among the last official combat action in the European conflict. 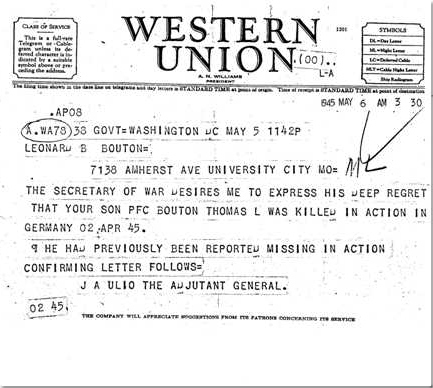 Telegram that informed the family about Thomas Bouton's death. In the night of the first to the second of April Tom was a member of a night-raiding patrol sent out on a special mission into enemy-held territory in Western Germany nearby Düsseldorf. He was fired upon several times and escaped injury. He was attempting to return to his own unit when he was killed in action by a German sniper while crossing the Rhine River in the early morning of April 2nd, 1945. He was age 19 years and one month. Letter from Cpt. 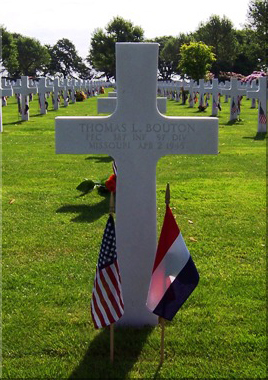 Ouddeback of the 387th Infantry Regiment to the parents of Thomas Bouton. 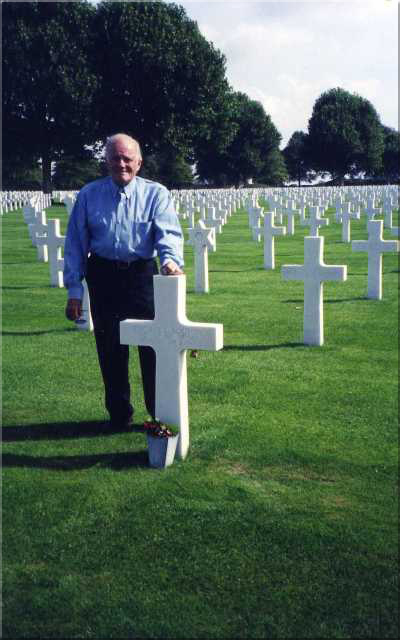 Donald Jaenicke, Thomas Bouton's cousin, at Thomas' grave in 2003. Mrs. Karen Carnesciali, daughter of Paul Jaenicke, cousin of Thomas Bouton. 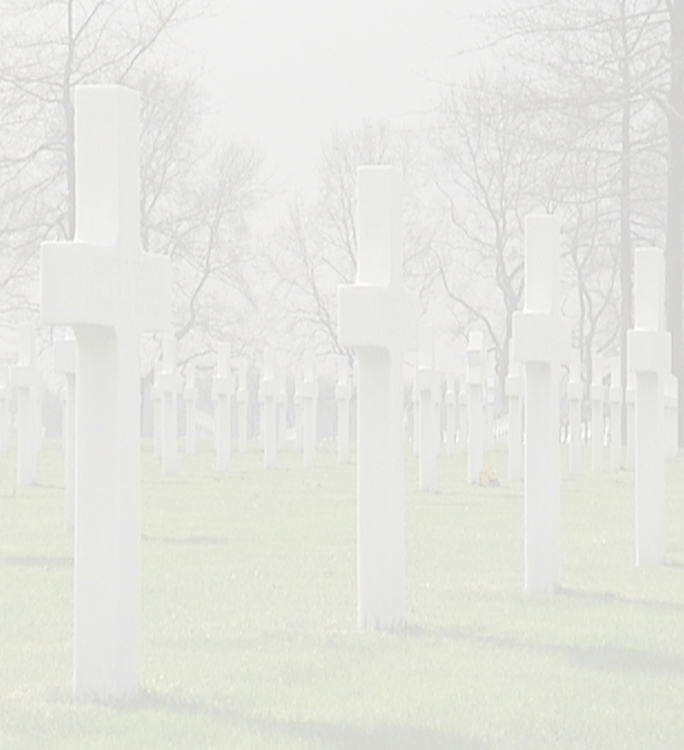 Her father Paul Jaenicke also served in Europe during WWII.